A wonderful godchild of mine just published a terrific books. It is kind of theological science fiction by genre – in the long line from Charles Williams, Lewis, Tolkien, etc. The plot involves the wife of a Celtic Studies scholar who travels to Ireland to find out whether her husband was murdered by a cult group into reviving pagan ritual in an attempt to take over the world. The style is terrific. There are beautiful characterizations of the wife and her mystical little boy and lots of quotations from all our favorite writers of classics of the past. 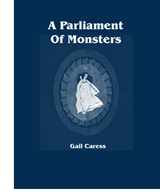 To find out more go to Beachhead Books on the web and look for Gail Caress.